Local Lib Dem councillors in the Holyrood Ward in the Prestwich area have been campaigning with local residents to save the last bank branch in the ward, the Royal Bank of Scotland on Bury Old Road near Heaton Park. Although many people recognise that banking has changed significantly over recent years, we also need to recognise that bank counter services are important for many people, including small businesses, local community groups and some more elderly and vulnerable members of the community. The nearest RBS branches are on Cheetham Hill and in Bury Town Centre. The cash machine (on the corner of Bury Old Road and St Margaret’s Road) would also be closed is the ONLY free cash machine close to Heaton Park, a rather popular destination! Thank you for everyone who has supported the campaign so far. We need to keep up the pressure and have a meeting with RBS in a couple of weeks. If you can please sign the online petition at www.loveprestwich.co.uk or you can sign in person in the Fresh Cookie sandwich shop on St Margaret’s Road. 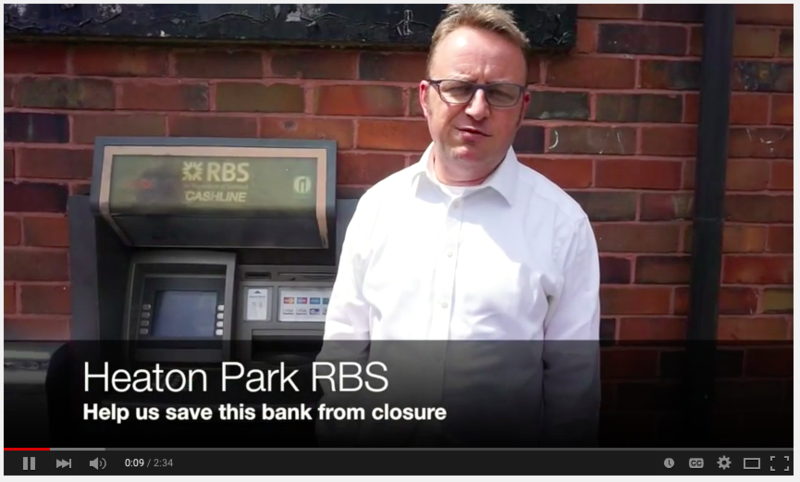 We’ve made this short video to highlight the problems from the bank closure. I’ve always been a keen supporter of your efforts, but this campaign I think is misguided and a waste of your effort. Rbs also own Natwest, there is one in the village! The bank was bankrupt and is owned by us, the UK public!!! To keep open a branch open when both Barclays and Natwest closed in Whitefield, it’s the economics of the mad house to keep it open! There are plenty of buses that access the village from that area and most people these days bank online. Just for accuracy’s sake, please note that there is actually another free ATM in the vicinity – a machine outside the little Tesco store on the row of shops on Bury Old Road, the row which includes Armstrong’s.